These are the ultimate holiday light timesaver. 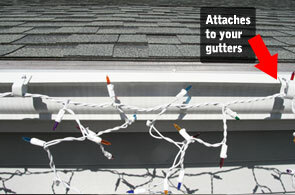 They attach to your existing gutters to alow you to easily and quickly hang your Christmas lights up to two stories without even using a ladder. 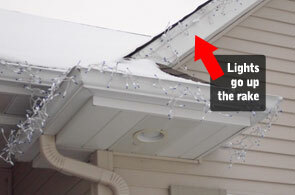 The hooks can also be installed along the rake board to go up to the roof peaks without gutters. 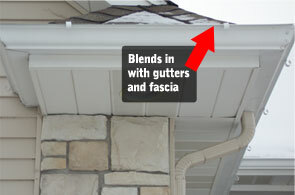 Hang ’Em High Light Hooks™ blend in with your gutters and fascia, so when the lights are taken down there is no need to remove them. They are EXCLUSIVE to All Eastern Iowa Gutter, Inc. Hang' Em High Light Hooks was created by Randy Oxley, owner-operator of All Eastern Iowa Gutter, Inc.